Shuttle Discovery rolls to pad 39A for its February launch to the space station. WASHINGTON -- Astronomers using NASA's Swift satellite and Fermi Gamma-ray Space Telescope are seeing frequent blasts from a stellar remnant 30,000 light-years away. The high-energy fireworks arise from a rare type of neutron star known as a soft-gamma-ray repeater. Such objects unpredictably send out a series of X-ray and gamma-ray flares. Scientists think the source is a spinning neutron star, which is the superdense, city-sized remains of an exploded star. Although only about 12 miles across, a neutron star contains more mass than the sun. The object has been cataloged as SGR J1550-5418. While neutron stars typically possess intense magnetic fields, a subgroup displays fields 1,000 times stronger. These so-called magnetars have the strongest magnetic fields of any known object in the universe. 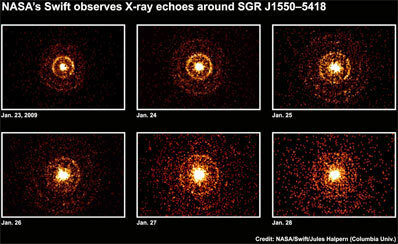 SGR J1550-5418, which rotates once every 2.07 seconds, holds the record for the fastest-spinning magnetar. Astronomers think magnetars power their flares by tapping into the tremendous energy of their magnetic fields. "The ability of Fermi's gamma-ray burst monitor to resolve the fine structure within these events will help us better understand how magnetars unleash their energy," said Chryssa Kouveliotou, an astrophysicist at NASA's Marshall Space Flight Center in Huntsville, Ala. The object has triggered the instrument more than 95 times since Jan. 22. Using data from Swift's X-ray telescope, Jules Halpern at Columbia University captured the first "light echoes" ever seen from a soft-gamma-ray repeater. Images acquired when the latest flaring episode began show what appear to be expanding halos around the source. Multiple rings form as X-rays interact with dust clouds at different distances, with closer clouds producing larger rings. Both the rings and their apparent expansion are an illusion caused by the finite speed of light and the longer path the scattered light must travel. "X-rays from the brightest bursts scatter off of dust clouds between us and the star," Halpern said. "As a result, we don't really know the distance to this object as well as we would like. These images will help us make a more precise measurement and also determine the distance to the dust clouds." NASA's Wind satellite, the joint NASA-Japan Suzaku mission, and the European Space Agency's INTEGRAL satellite also have detected flares from SGR J1550-5418. NASA's Goddard Space Flight Center in Greenbelt, Md., manages the Swift satellite. It is being operated in collaboration with partners in the U.S., the United Kingdom, Italy, Germany and Japan. NASA's Fermi Gamma-ray Space Telescope is an astrophysics and particle physics observatory developed in collaboration with the U.S. Department of Energy and with important contributions from academic institutions and partners in France, Germany, Italy, Japan, Sweden, and the U.S.